Holy Moly! Aliens and their little space ships are swarming all over the landscape. How can I get them to leave our quiet little planet and go back to where they came from? 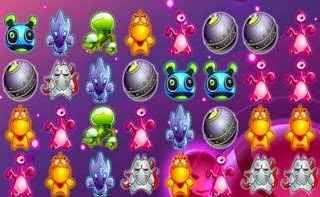 That's the premise behind Loose Alien Puzzle Craze, a new matching game for iOS devices. Your job is to match the aliens by lining up three or more in a vertical or horizontal line. Of course you've done that before in games that match bits of candy or animals. But Loose Alien Puzzle Craze is populated by a menagerie of wild-looking space creatures, including the dreaded xenomorph. You can play the game by ascending levels, try scoring with a time limit or just swipe, dash, and crush. Along the way you'll earn power-ups like a Shapeshifter or an Alien Trap. Download the game for free in the iTunes Apps Store and follow the gamers @DeepBeaverIdeas on Twitter.